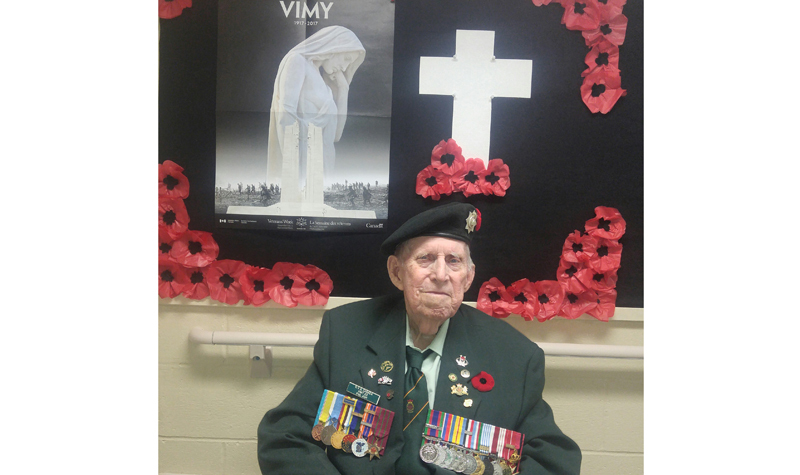 Burnbrae Gardens resident Phillip Ash is pictured here in his uniform in front of the memorial the home has created for Remembrance Day. York University students pose with a wreath made by Willows Estate residents for Remembrance Day. 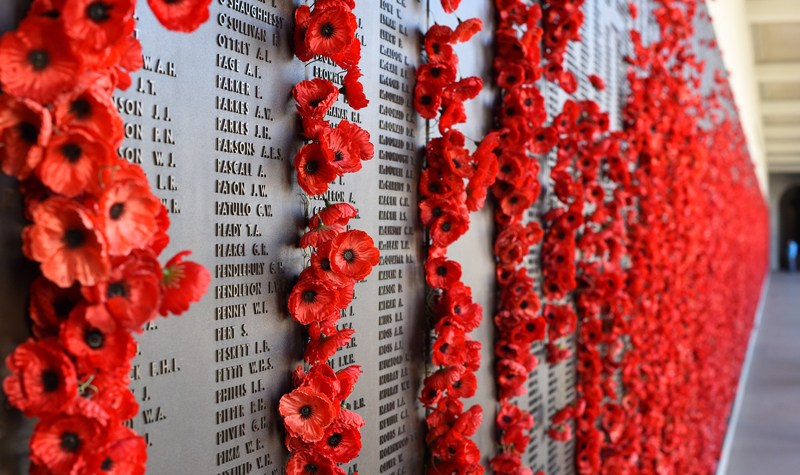 program that honoured those who have served in the Armed Forces. Residents were provided with visual and auditory PowerPoint presentations incorporating photos; John McCrae’s famous poem, In Flanders Fields; and a sounding of trumpets. Afterwards, the students encouraged residents to share their memories of people who served in the military. As part of a question-and-answer session, residents explained to the group what Remembrance day means to them and why it’s an important part of our culture. Residents also spoke about their family members who had served. “They were talking a lot about their own parents and what they went through — a lot of the residents said that, in their homes, war was not to be spoken of,” Jacqueline Sands,one of the students, tells the OMNIway. Aside from the program’s obvious cognitive benefits, the activity also focused on residents’ motor skills. The students guided residents as they made impressive memorial wreaths that were displayed in the Aurora long-term care home. Sands says she and the other students were most impressed by the residents’ teamwork that day. If you have a story you would like to share with the OMNIway, please contact newsroom at 800-294-0051, ext. 23, or email deron(at)axiomnews.ca. If you have feedback on this story, please call the newsroom at 800-294-0051, ext. 23, or e-mail deron(at)axiomnews.ca.